Most of my Facebook group members or folks who see me post in embroidery groups know that I have a physical goods shop on Etsy in addition to my shop for digital files (embroidery designs). It’s called the Honeybee Workshop, and one of my most popular items in that shop is this “Hand picked for Earth” baby bodysuit. I allow customers to personalize the bodysuits with a relation and/or name, and colors as they choose as well. I make about 3 or 4 of these bodysuits a week, and I consider it an honor to make something so unique for a grieving parent or family. Well, I was really busy last week putting the finishing touches on my 2017 Printable Planner so I put my physical embroidery orders off until the weekend. On Saturday morning, my husband took the boys off to the grocery store and I started calling up my .PES files I’d made the night before. I whizzed through the first three bodysuits (LOVE my multi-needle! Literally set it and forget it! I did laundry while they stitched!) but then when I got to the last order, for whatever reason I felt something stopping me from making it. Something told me that there was something different about this order, and I thought I needed to message the customer and be sure I had the colors right. Again, I have no idea why I felt this way – she didn’t request anything special or ask me any questions in her notes. So I sent off a quick Etsy message clarifying the colors and gender for the bodysuit. Unfortunately, as of Sunday afternoon she still hadn’t written back. I use Etsy exclusively for communication, since they only accept messages sent via their system as proof if there is a problem with an order. Sadly, many customers do not get a notification when they receive a message, so they don’t see your question. I had already printed her shipping label by mistake, so I needed to know how to craft this bodysuit as soon as possible! I started thinking.. 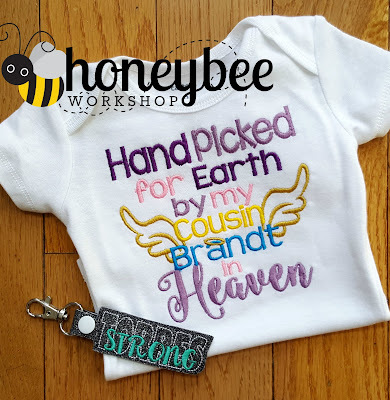 I have her full name, and the name of the relative for the memorial portion of the bodysuit was pretty unique, so I decided to take a leap and do a Facebook search for the customer’s name along with the name “Brandt.” Boy, did I find exactly what I was looking for – and more! It turns out that Brandt was the name of a teenage boy who died as a result of a tragic accident. I found Facebook posts from his family and friends, as well as a GoFundMe page raising funds. There was a common theme in many of these posts: loved ones continually hashtagged the phrase “Torres Strong.” This struck me as especially interesting as I had just completed a snap tab with the phrase “Louisiana Strong” not even an hour earlier, per a customer’s request. Using my software and bits and pieces from the Louisiana keychain, I crafted a keychain with the phrase “Torres Strong” to send to this relative along with her bodysuit. This took me about fifteen minutes, including stitching, and I know that it will mean a lot to this mom and her family! Technology is so amazing, and I know that many use it for nefarious purposes. But there are so many ways that I’ve used social media in the past to do something nice for someone who did not expect it, and this was the first time I’d played “sleuth” to create something special for a customer in my embroidery shop. I don’t know that it’s always appropriate or fitting to look up your customers on Facebook, but I do encourage you to do something a little extra if that feeling tugs at your heart like it did on mine with this order!